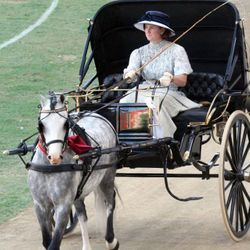 Carriage driving at shows is often seen in two forms – Light Harness and Heavy Harness. Light harness classes are those for the lighter boned breeds of horses and ponies. 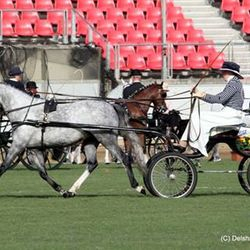 Animals such as hackneys, saddlebreds, standardbreds, Australian stock horses, thoroughbreds, Arabians, Andalusians, Welsh ponies and cobs, Australian ponies, Shetlands and miniature horses and ponies are generally shown in these classes in vehicles such as viceroys, sulkies, jinkers, gigs, joggers, buggies and other relatively light two and four wheeled vehicles. The majority of classes are for single horses and ponies but sometimes classes are included for multiples, usually pairs, tandems or teams. 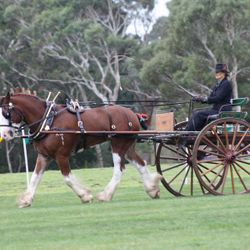 The Heavy Harness classes, often termed the Business and Delivery classes, cater for the heavier draught breeds of horse such as Clydesdales, Percherons, Shires, Australian Draught Horses and Belgian Draughts and various crosses with these. They are often shown in delivery vehicles such as milk and bread carts, spring carts and wagons. Classes for multiples (eg pairs and teams of four) are frequently included, as well as those for singles. 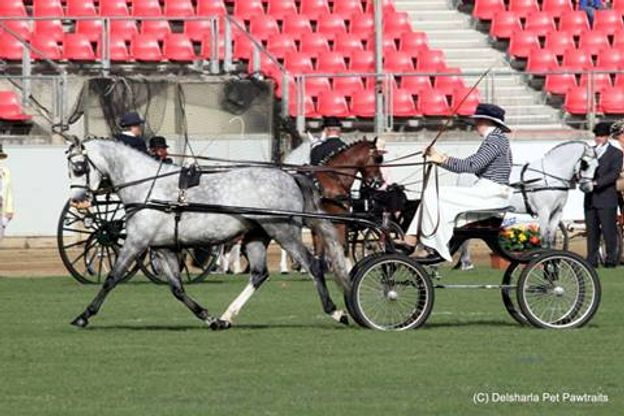 At most agricultural shows Light Harness classes usually consist of: height and turnout classes, whilst the Heavy Harness / Business and Delivery section generally divides the horses into three classes of delivery horse - Light, Medium and Heavy, as well as having turnout classes. Pleasure and driver classes are sometimes seen on more extended programs. The ACDS has a tradition of running an annual National Show, which moves around to a different state each year, and annual State Shows. 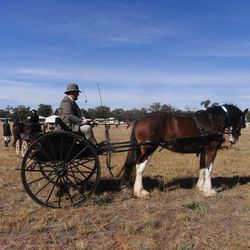 These ‘all harness’ shows have much larger programs than agricultural shows, with a wide variety of classes to cater for the range of horses and ponies and vehicles driven by carriage drivers. Classes for CDE vehicles are a recent innovation in these shows and are proving popular. 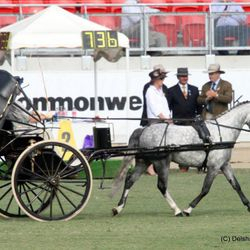 For guidelines on show driving, both Light and Heavy, download the 2012 ACDS Show Driving Handbook, on this website, or as a hardcopy from the Federal ACDS Merchandising Officer (see www. acds.org.au for contact details). The handbook includes many details on different types of show classes, turnouts, what to wear, and various workout patterns that may be asked for by judges. 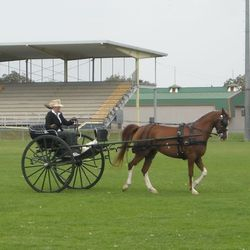 All drivers are encouraged to compete in the harness classes at shows whenever possible. 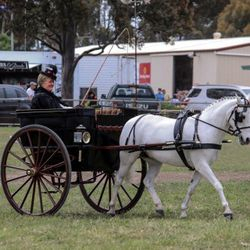 Horse drawn vehicles of all types are great crowd favourites and showing in harness is one of the best ways to show off our sport to the public. It is important not to be put off when, after reading details about harness and vehicles in the handbook, you realise you do not have all the ‘correct’ gear. As long as your horse, harness and vehicle are safe, go in the classes. Make sure your horse and turnout is as clean as possible, and have your hat, knee rug or apron, gloves and whip. Very few turnouts in Ag and Breed Shows have everything right. Let the judge make the decision. You could be very pleasantly surprised about how well you do! Little by little you will probably gather together the better gear for show classes, but keep competing on the way. Royal Shows are of course a different story – the overall standard is much higher. However showing in harness at a Royal is a wonderful thing to aspire to, and is well worth the effort.